U.S.-Southeast Asia: Building Strategic Relationships | The Hollings Center for International Dialogue | The Hollings Center for International Dialogue is a non-profit, non-governmental organization dedicated to fostering dialogue between the United States and countries with predominantly Muslim populations in the Middle East, North Africa, South Asia, Eurasia and Europe. American attention in the Pacific region has shifted to northeast Asia because trade and security disputes with China and North Korea have become the focal point of U.S. foreign policy in the region. 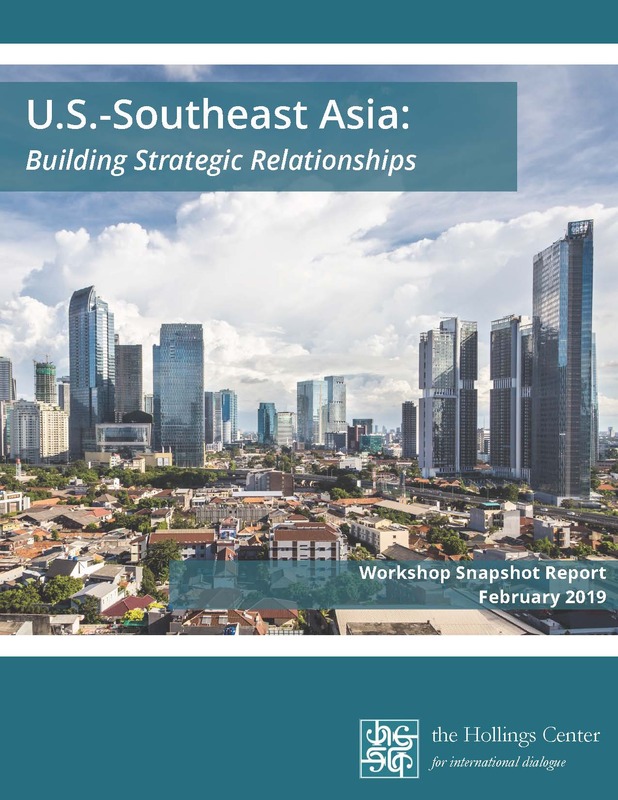 As a result, Southeast Asia has received secondary attention from the United States and may even be considered through the lens of U.S.-China competition. However, countries in Southeast Asia, particularly Indonesia and Malaysia, have proven to be durable economic, diplomatic, and military partners of the United States in an area where regional geopolitics determines global power. At the governmental level, U.S. relations with these two countries have been steady over the past decade through collaboration on regional stability, which counters religion-based violence, improves trade, and demonstrates a willingness to offset Chinese influence. This region features some of the highest popular favorability ratings towards the United States over the past three decades, but in recent years these ratings have dropped below 50 percent. Intergovernmental cooperation continues, but efforts could be made to improve popular perceptions of the United States in the region. Coupled with domestic developments in both Malaysia and Indonesia, a unique opportunity exists for the United States to assess and strengthen its relationships with these countries. Support regional democratization efforts. Both Indonesia and Malaysia are entering critical periods for their democracies. Indonesia will conduct elections in 2019 at a time when popular perception of democratic progress has somewhat stagnated. Malaysia underwent a transformative election in 2018 and will be challenged by the high expectations that election created. American support for programs and democratization efforts during this time would be appropriate. Focus on American soft-power strengths. American strength in technology, education, healthcare, and commerce, some participants argued, could be better featured and used in American diplomatic and commercial efforts in the region. Participants called for better trade relationships, increased corporate investment, and expert management by the United States in the region. Focusing on these strengths, rather than directly countering the influence of China, will help maintain America’s important standing in the region. Support Southeast Asia’s collective economic potential. Southeast Asia boasts tremendous economic potential and is already a place of significant investment by the United States. Continued effort in promoting trade in the region and developing complementary bilateral policies between the United States and countries like Malaysia and Indonesia will help expand this potential. The United States can also serve, when possible, as a mediator in intraregional trade issues. Look for cooperative opportunities with China. According to participants, the competition between the United States and China in the region is creating tension among Southeast Asian states. Although some elements of competition are likely unavoidable, cooperation between the two countries in certain areas, such as disaster management, could significantly ease regional concern. Understand the effect of other international and domestic policy decisions. Participants cited multiple examples of how domestic political issues in the United States or American foreign policy decisions in other parts of the world have created a negative effect on regional perception of the United States in Southeast Asia. Better understanding of popular perceptions and regional attitudes can help to avoid damaging relationships and help to explain American positions.